What better way to kick off the summer season and celebrate B&G Oyster’s 5th patio opening than with an oyster extravaganza? Join us on Sunday, May 3rd for a day filled with friendly (and tasty) competitions, a discerning panel of judges, cold beer and oyster-friendly wines, signature small plates, unlimited oysters, and even appearances by the WORLD’S fastest oyster shucker! 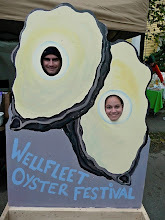 Tickets are available by calling (617.423.0550) or visiting B&G Oysters and are $45 per person in advance ($55 day of). Ticket price includes admission, one raffle ticket, two drink tickets, and unlimited oysters along with passed signature dishes & competition dishes. A portion of the proceeds will benefit the Massachusetts Oyster Project, an organization dedicated to the restoration of oysters to marine estuaries in the Boston area. The celebration will continue across the street at Stir (102 Waltham Street), where B&G servers and chefs will host “What’s your Oyster Profile?” classes throughout the afternoon. The 45 minute class will explore east coast and west coast varieties and include a sampling of oysters and a glass of wine. Tickets to the class will be available for $40 (or $75 for class plus entrance to the Oyster Invitational) and a spot may be reserved by calling or visiting B&G Oysters. In addition to the classes, author Rowan Jacobsen will be at Stir for an afternoon book signing. 12:30 to 1:15 “Discover Your Oyster Profile” Stir Seminar*: Are you more East Coast or West Coast? B&G servers Heather Kennaway and Mark Simes will guide guests through the ins and outs of East and West Coast oysters complete with a sampling of different varieties and glass of wine. 1:15 World’s Fastest Shucker Demo: Our guys are fast but this guy is faster! 37 oysters in 2.5 minutes fast to be exact! William “Chopper’ Young from Wellfleet is the fastest shucker in the world and winner of the Guinness World Oyster Opening Championships and he’s here to demonstrate his shucking prowess. 2:00 World’s Fastest Shucker Demo: William “Chopper” Young demonstrates his unique oyster shucking technique, which has earned him bragging rights as the world’s fastest oyster shucker. 1:30-2:15 Chef’s competition: Best Original Raw presentationWhile we all appreciate the sublime simplicity of an icy, unadorned oyster, a little creativity from chefs is always a fun thing to observe (and taste). For this competition, three chefs will think outside of the box and present their most original raw oyster dish. 3:15 World’s Fastest Shucker Demo William “Chopper” Young, the world’s fastest oyster shucker shows off his stuff. Be quick, or you might miss it; Chopper can shuck 37 oysters in 2.5 minutes! 4-4:45 Chef’s Competition: Best Riff on a ClassicOysters on the half shell with mignonette, oyster po’ boys, & oysters Rockefeller are all tried and true classics but in this competition, participating chefs will present their modern take on a favorite, time-honored dish.